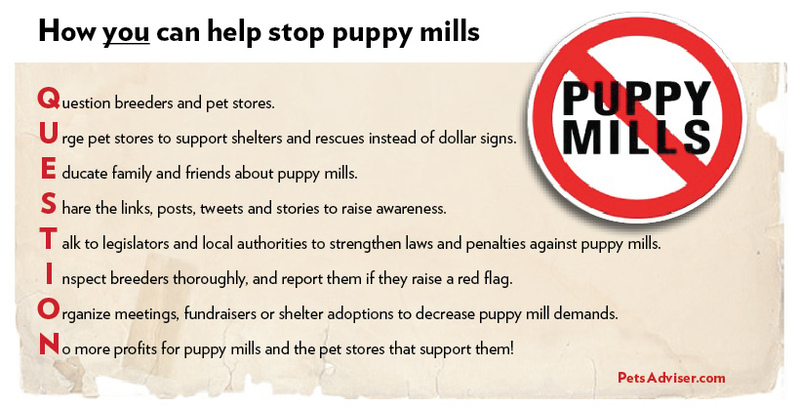 The goal of a puppy mill is to produce as many puppies as possible in order to make money. Dogs are kept in small cages they don’t leave until they are no longer able to reproduce and then are euthanized. They and their puppies go without human interaction or medical attention in small over-crowded cages. Other than the fact that it’s inhumane, the puppies that come out of puppy mills are not properly socialized and often have health problems. Often by 5 weeks a puppy’s behaviours and tendencies have been set. If they spend this time in over-crowded, filthy cages they may grow up to be fearful, anxious, and aggressive. Even if this pup gets a good, safe home it will carry these tendencies through it’s entire life. Dogs in puppy mills are not given medical care and are used to breed until it is no longer possible, even if they are ill. Sick dogs will produce sick puppies. Even puppies born to healthy parents may end up ill from the poor, cramped conditions. The illnesses will not always be apparent immediately and you could end up with pricey vet bills even a year later. 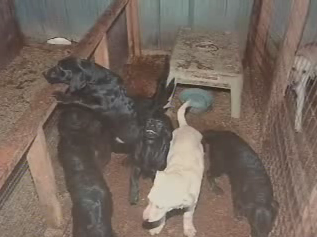 Some puppy mills create websites where they claim to be small scale professional breeders. They post photos making it seem like a small family operation where the dogs are cared for. To avoid falling for this trap, don’t purchase a dog from anyone unless you can go right to their facilities and check it out. Some professional breeders don’t take care of their dogs properly either, so even when you know it’s not a puppy mill it’s a good idea to check out living conditions of any dog you’re thinking of purchasing. Don’t always trust pet stores when they say their dogs are not from puppy mills. Some pet stores claim that their dogs are from breeders, but according to the Humane Society of the United States 99 per cent of dogs in pet stores are from puppy mills. Consider adopting a dog instead. Approach a dog rescue organization and let them know what type of puppy you are looking for. Maybe a puppy isn’t right for you and you need an adult dog who’s a little lower on energy? Maybe you need a pup high in energy to help keep you active? Perhaps a small dog the children can walk would be better for you? If you want a specific breed look for a rescue that deals with that specific breed. Rescues can work with you to help you find the dog that will be perfect for your home and family.